It was a surprise to me that an electric vacuum cleaner manufacturer send an e-mail saying that it’s the time to wash your filter. Frankly, it’s not so difficult to send a automatic mass e-mail for eMarketer. But, I never expected to receive an service alarm mail from home electric manufacturer like Dyson. Even car makers which sell really expensive products don’t send something like a service alarm mail as Dyson do. Normally, manufacturers might think it’s the end of sales when customers buy their product. But, Dyson might think differently. It seems to me that they are thinking me as a their life time customer. It’s amazing because they are the only manufacturer like that. 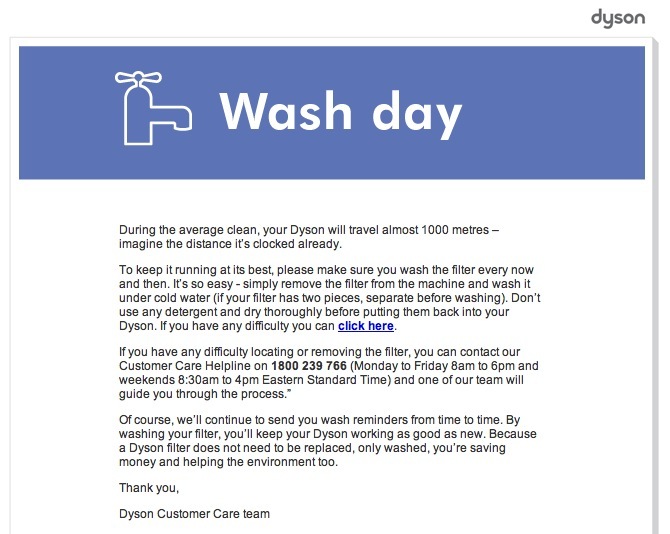 Good on you Dyson. Well, but considering the high price of their products, my impression was a little diminished.